There is no substitute for excellence - not even success. It rained most of the day today. I happen to love rainy days but it was nice when the sun peeked out around 8pm so I could go for a walk. When I got home from my walk, I took a few minutes to spray the Geraniums and Phlox with Liquid Fence. I use Liquid Fence because I'm at war with the blasted deer that roam our neighborhood, even though we're well within the city limits. They sneak in for their nightly meal of Geraniums and Hostas...and practically anything else green. There's not much out there that they don't like. It's really disheartening to spend so much time and money to have some color during our short growing season (basically from Memorial Day to Labor Day), just to wake up one morning to find everything wiped out by Bambi and his mother. I once went to the Garden Store and told the clerk to either sell me a gun or sell me some Liquid Fence. He had no guns to sell me so you know what I came home with....besides, I wouldn't know what to do with a gun anyway and would probably just hurt myself! Here's a fact for you: Liquid Fence stinks to high heaven...wherever high heaven is. That must be a Southern saying because my mother, Aggie, used it all the time. Aggie was born in Montana but quickly picked up Southern euphemisms when she moved to Texas to marry my dad. 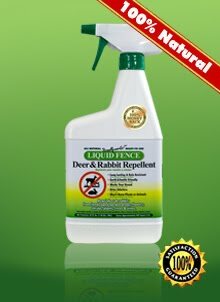 In case you've never been introduced to Liquid Fence, it's a deer and rabbit repellent manufactured by (of course) the Liquid Fence Company of Brodheadsville, Pennsylvania. Wikipedia (if it's there, it must be true, right?) says the population of Brodheadsville is around 2,000. No wonder! If all of Brodheadsville smells like Liquid Fence, I understand why very few people would live there. Their flowers probably grow well, though, because they most likely have no deer in Brodheadsville! Why does it stink? The label assures customers that it's 'All natural, long lasting ... and will stop deer and rabbits from eating your flowers, shrubs, vegetable plants, trees and vines. And rest assured, it won’t harm your plants or animals!' The label also refers to garlic and whole egg...that's got to be what's so icky...garlic and whole egg (inedible according to the label) ferment in Brodheadsville! I've tried all kinds of solutions to the deer problem (human hair, Irish Spring soap, etc), but none seem to work like Liquid Fence. So I'll just keep waging my war and hope that I can hold Bambi off long enough for the Phlox to bloom. Tell me, how do you keep the critters away? No food pictures tonight! I cooked two days in a row and that was enough mess for me. Instead, The Don and I headed for the Villager Pub for their Wednesday night special: all you can eat Spaghetti. It's really good...and someone else does the dishes!